This is a guest post by Margaret Kelsey Tatkow. Margaret Kelsey leads the brand and content team at Appcues. Before Appcues, she built content programs for InVision’s design community for 3.5 years and has roots in painting and PR. She’s a big fan of puns, Blackbird Donuts, and Oxford commas—probably in that order. Stats around churn make unpleasant reading for product teams. 40-60% of free trial users engage with your product once and never again. It takes 75% of people less than 7 days to abandon a new software. And the more churning users you have, the more revenue you have to plow back into the business just to keep the bottom line steady. Since high churn rates kill products, driving them down should be one of your team’s biggest goals. 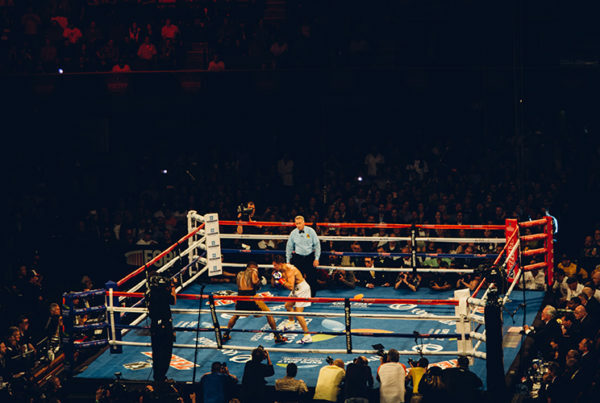 Checklist-driven customer onboarding can help fight those scary churn stats. Onboarding checklists tap into deep-rooted psychological principles of motivation and success to increase product activation and adoption. Let’s take a closer look at checklist-based customer onboarding and some examples of products using it to fight churn. What’s the connection between onboarding and churn? There are tons of reasons why a customer might churn in the first week with a software. Maybe they didn’t find the specific feature they were looking for. Maybe they went with a competitor on price. Maybe they decided they could solve their need without a product after all. All are valid reasons to abandon a product during onboarding. But the truth is, the majority of churning users don’t quit your product for these reasons. Most users quit because they fail to see the value in what you offer. 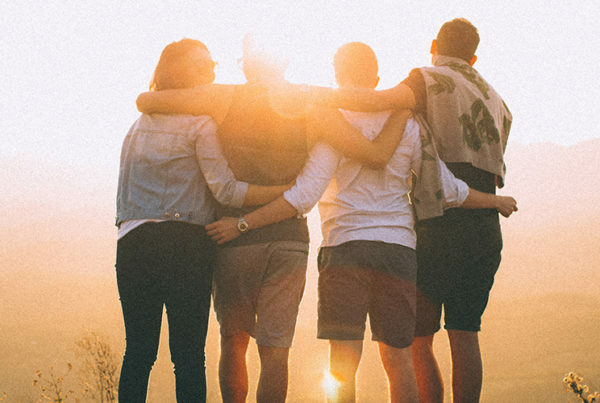 Take the example of former HubSpot Product Manager Dan Wolchonok: After polling users who churned within week one of using Sidekick, an email tracking tool, Dan found that 60% left because they failed to see value or didn’t understand how to use the product. That means almost two-thirds of new users were excited by the marketing value proposition but disappointed once they saw the actual product. Ouch. The good news is, you can have a direct impact on both these factors during user onboarding. Product teams should treat onboarding as their best opportunity to lead users to their aha moment, the realization of the true value of what you offer. Onboarding is also one of the best times to walk customers through the key features that correlate to lower user churn because you have greater control over what a user does and sees in onboarding. Driving down churn through effective onboarding can have a big impact on the bottom line. Customer.io’s Janet Choi claims that a 1% improvement in customer acquisition affects your bottom line by about 3.3%—but a 1% improvement in retention improves your bottom line by around 7%. The impact of retaining one more customer per month is much bigger than most people realize. And this is where onboarding users with checklists comes in. What makes checklists such a powerful way to reduce churn? Good ol’ fashioned psychology. Checklists tap into psychological principles that enable users to make enjoyable, frictionless decisions. And frictionless decisions make for higher user retention. You might associate dopamine with chocolate, the post-exercise high, or stimulants. But our bodies also release the pleasure chemical when we successfully complete a task. With each perceived success, our brains release dopamine— making us want to repeat the success-related action. Which, in a nutshell, means that we’re psychologically hard-wired to enjoy crossing things off checklists. The brain perceives each completed task as a success and wants to repeat it. Neuroscientists call this as self-directed learning, in which attention gets locked onto the task at hand and motivation stays high. When it comes to product onboarding, checklists create a framework through which users can experience success and stay motivated to learn more about the product. Products like I Done This and Todoist are built off the back of this psychological principle. Not only are we hard-wired to feel good when we complete tasks, but we’re also hard-wired to feel bad when we leave stuff half-done. That’s down to the human “bias for completion,” the phenomenon of our brain seeking out completed tasks. In the case of onboarding checklists, completion bias can be a powerful way to keep users engaged. A checklist provides a visual representation of unfinished tasks and lets users know how close they are to getting that dopamine hit that comes with a finished task. Good user onboarding relies on reducing cognitive load—the amount of brainpower the user has to employ when using the product. Checklists do that thanks to the mere exposure effect, the phenomenon that explains our preference for things that are familiar. Checklists are familiar. Many know how they work. Users expend very little cognitive energy on a checklist (read more on NomNom) and feel relaxed thanks to mere exposure. Onboarding experiences with low stress and low cognitive load are winners when it comes to retention. These psychological principles combine to produce powerful subconscious emotions around the humble checklist. Checklist-based onboarding sets users up for feelings of pleasure, achievement, and motivation, while simultaneously removing friction from the learning process. 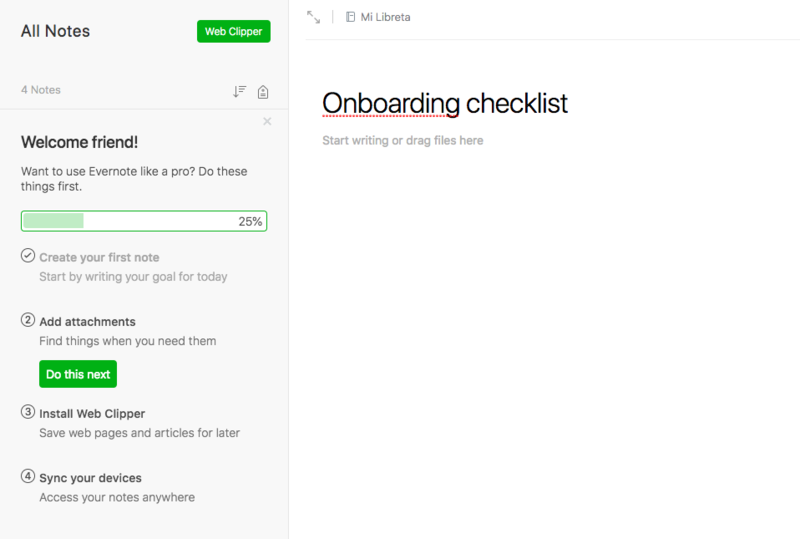 In other words, onboarding checklists set users up for success. While there are various types of checklists you can use to drive down churn rates, these 3 examples show the power of onboarding checklists for just about any product. Quick-win checklists present users with fast, easy-to-accomplish tasks. Why? Because, each checked-off task releases dopamine, and dopamine is the key to forming habits. Evernote uses a quick-win checklist to instill habit-forming behaviors and get users to their aha moment fast. The app’s principal value prop is that you can organize and access your notes anywhere, anytime. So the first checklist item—”create your first note”—reflects that. Completing this task takes no longer than a couple of seconds. Users have checked something off their task list less than a minute after signing up and have seen the core value of the Evernote product. Aha moment achieved. The follow-up tasks are all low-hanging fruit for the user—things that can be done quickly and will still kick off small bursts of dopamine. Also, bonus points for Evernote’s manipulation of completion bias with the 25% loading bar. Have a focused, specific aha moment. Evernote, a product that’s core functionality remains constant regardless of user persona, is a great example. Rely on user habits—extrinsic user motivation—rather than external influences such as work environment. Think about Instagram: The drive to use the app comes from within the user because they’ve formed pleasure-based habits around the app. To implement a quick-win checklist, you need to focus on the product’s aha moment and the common conversion activities that correlate with lower churn. Tools like Appcues’ Checklists have customizable onboarding checklist features that allow you to set up and iterate on onboarding checklists fast. Complex products call for more complex checklists. 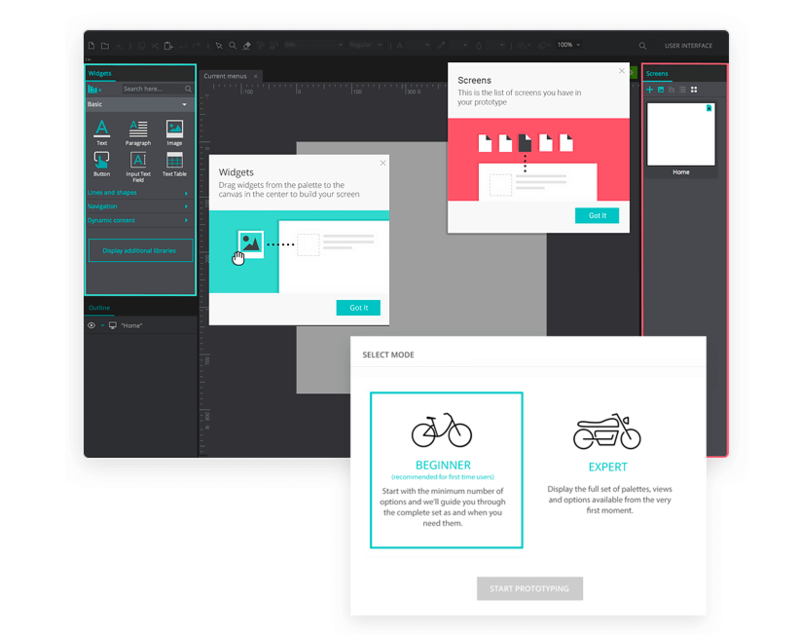 Take the example of Justinmind, the collaborative prototyping tool. Justinmind has a crowded user interface that can be overwhelming. So, Justinmind built personalized tutorial checklists into their onboarding. Users are divided into experts or beginners based on their prototyping experience. Beginners are presented with a simplified interface and a series of simple tasks to check off. Experts get the full range of features and access to more advanced tutorials. What’s more, by asking users to actively engage with the product, the Justinmind team is tapping into the “Ikea Effect.” This phenomenon states that if you make something with your own hands (or mouse clicks), you value it more highly. Asking users to do some actual work during onboarding, like a guided tutorial, will increase their long-term commitment to the product. Multiple possible use cases. Our example of Justinmind, for example, can be used for diagramming, wireframing, and interactive prototyping. Several differentiated user personas. A UX designer making an app will have a different aha moment than a business analyst. Be sure to make each tutorial in the checklist optional. Users should be able to choose their own adventure in flexible products; obliging them to work through tutorials irrelevant to their use case will increase churn. Named after psychologist Bluma Zeigarnik, the Zeigarnik effect explains why we get hung up on unfinished tasks. Zeigarnik observed waiters at work and figured out that the servers could only remember orders before serving them. As soon as the meal was served, the waiters wiped the task from their memory. The Appcues blog has a great example of how blogging platform Ghost harnesses the Zeigarnik effect to reduce churn. 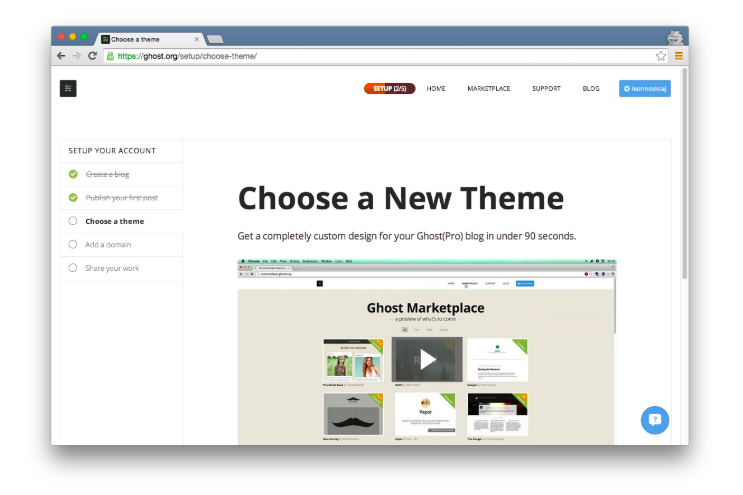 The Ghost team found out that users who customized their blog theme during onboarding were 10x more likely to move on to a paid account. So the team added a task to the onboarding checklist for users to watch a video about theme customization and sent out reminder notifications to any new users who left that task unfinished. The results showed that 26% of new users who watched the video from the checklist added a custom theme, compared to 7% of those who didn’t watch the video. By reminding users about the uncompleted checklist task, Ghost moved users one step closer to seeing the value of their product. For some products, a complex setup process is inevitable. Products that require a certain amount of personalization, for example, have to ask you a bunch of questions during setup. 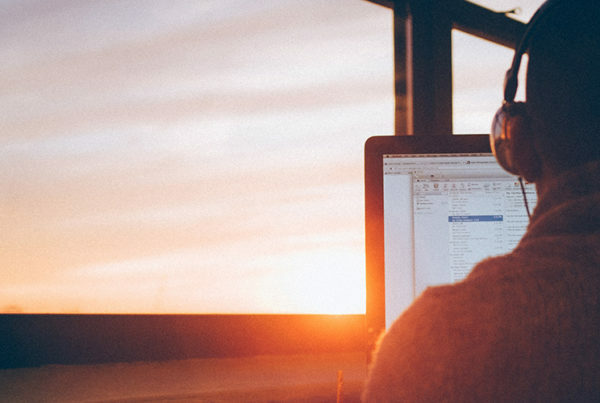 User motivation is finite, but a Zeigarnik checklist can help keep users engaged. Break onboarding steps into the smallest possible chunks. Set expectations around how long the onboarding will take to complete. Provide visual progress indicators—like an animated progress bar—to gamify the UX. Ready to implement an onboarding checklist? Check! Okay, now you that know checklists are a powerful way to reduce churn and have some great examples to inspire you, the next step is to implement a checklist into your product’s onboarding. Tools like Appcues make it fast to get a checklist set up and come with back-end analytics to help you optimize the experience for churn reduction. Once you get the checklist set up, experiment with ways to tap into the psychological principles behind checklist success. Setting users up for small successes, leading them to their aha moment, and highlighting the value of your product will help drive down churn and increase retention. Along the way, you’ll gain deeper insights into your product’s value proposition, setting you up for even lower churn rates in the long run. Margaret Kelsey leads the brand and content team at Appcues. Before Appcues, she built content programs for InVision’s design community for 3.5 years and has roots in painting and PR. She’s a big fan of puns, Blackbird Donuts, and Oxford commas—probably in that order.